I wrote about retractable tool tethers the other day, but what if you are looking for something a little cheaper and a bit simpler? If you want to get super simple, you could just use a bit of rope, but there are better solutions out there that don't break the bank. Lee Valley sells a tether that costs under $10 and still offers the bungee effect that will reduce the sudden stop at the end of a fall. With a heavy tool, the sudden stop after a fall could cause you to lose your balance and could possibly lead to a fall for yourself. So how heavy of a tool can you use? Well, the tether has a breaking strength of almost 375 lbs, so more then you can carry. The tether has a relaxed length of 2-feet and a total length of 6-feet. 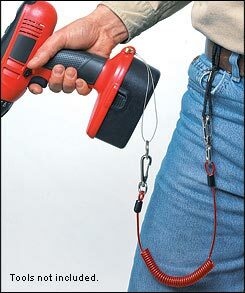 With this type of tether you will likely need a belt hook or similar to keep the tool on you, if not, you might set the tool down and forget about it when you walk away. The tether costs only $7.20 and comes with everything you need to attach it to your belt, and a verity of different tools.